The definition of Gamification is broadly accepted as: the use of game mechanics and game thinking, in a non-game context. The concepts of Gamification can be applied in a digital environment, or in a real-world context. Gamification has been widely adopted in several domains, such as in marketing (engage customers, generate buzz, etc. ), human resources (recruitment, increasing productivity, etc. ), fostering of creativity or generation of ideas, and even in goal tracking. The Gamification Of Learning applies the concepts of Gamification to an educational / learning environment, with the goal to maximise enjoyment of learning and engage learners, thus inspiring and motivating them to continue learning. This will eventually influence learners, causing them to develop a desired behaviour(s). 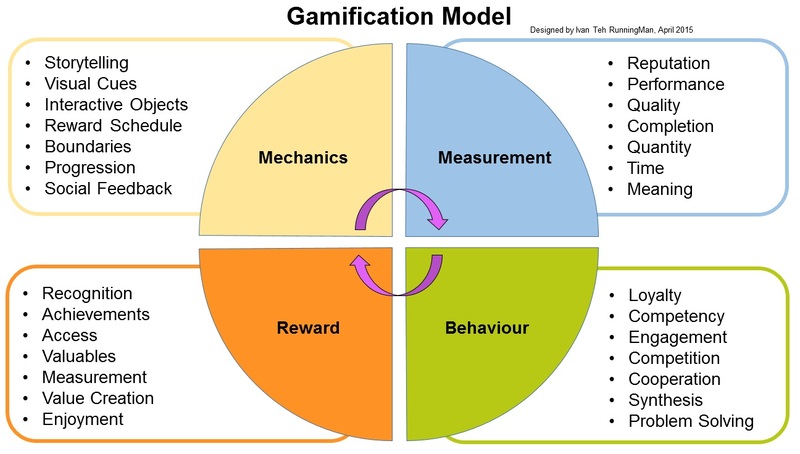 Here, I'll examine some of the Mechanics associated with Gamification, the various types of Measurements, the Behaviours it encourages, and the Rewards for the 'player(s)' or stakeholders. Mechanics refers to the elements that comprise Gamification. One of the key elements of Gamification is storytelling, the overall grand narrative that sets the 'game' in motion and defines its purpose, be it a quest or an adventure. The 'game' is often executed through the use of visual cues and interactive objects, be it digital or in a real-world context, which aids engagment of the 'players'. The 'game' will often have pre-defined boundaries and goals, with a logical system of progression. There will often be a reward schedule of some kind, be it incentives (rewards), or disincentives (penalties), for performance of certain tasks. There may also be elements of social feedback, wherein 'players' are able to engage with each other, or with the person in charge of the 'game', be they a trainer, developer, etc. Measurement refers to how progress in Gamification is evaluated. There are various types and scales of measurements used in Gamification, and a particular 'game' may utlilise one or more of these. They include reputation, which refers to an achievement or status attained; performance, which refers to how a task is carried out; quality, which refers to the level of excellence attained in a task; completion, which refers to the degree to which a task is fulfilled; quantity, which refers to a numerical amount attained; time, which refers to how quickly an action was performed, or how quickly a task was done; meaning, which refers to the interpretation, or learning, that a 'player' derives from the 'game'. Behaviour refers to the desired actions which 'players' will cultivate as a result of playing the 'game'. This is done through engagment, as a result of 'players' interaction with the 'game', or with other 'players', in performing a certain task, otherwise known as problem solving. While each 'game' has its own specifc set of behaviours it wishes to cultivate / encourage, there are some general types that apply to the majority of 'games'. These include loyalty, which refers to the continued engagement of 'players' over a period of time; or competency, which refers to the level of mastery a 'player' will achieve as a result of performing certain tasks. 'Players' may also engage in competition or cooperation with other 'players', which usually results in more engagement. Finally, 'player' may develop synthesis, or a combination of knowledge, skills / abilities, or attitudes, as a result of multi-tasking. Reward refers to the types of incentives given to 'players' for fulfilling a requirement or task in the 'game'. There can be a multitude of rewards, both digital and/or real-world, and encourages 'players' to strive to achieve them. Such rewards could include recognition, such as a status, title, trophy, or badge; achievements, such as a level up, filling of a progress bar, or a collection of symbols; access, in which a 'player' is granted privileged rights to a certain area or item; valuables; which could include digital items, physical items, actual cash, or virtual currency. Sometimes, a reward could simply be pure enjoyment of the 'game', or the objective could be to derive some form of measurement used for data tracking, such as weight loss or distance walked. Possibly the greatest reward is value creation, whether it be the 'player' learning something or deriving meaning from the 'game', or the 'game' is used to fulfill a certain objective that is noble, such as curing of an illness or paying homage to something. In conclusion, the Gamification Of Learning is useful in engaging learners, and aids their understanding, whether the 'game' is digital, or set in a real-world context. Not all elements of the Gamification Of Learning needs to be incorporated at all times, though theoretically, the more elements a 'game' has, the more effective it should be.